Nottingham Lakeside Arts has announced the forthcoming opening of the exhibition Scaling the Sublime: art at the limits of landscape. The exhibition has been curated by art historian Nicholas Alfrey and artist Rebecca Partridge and includes the work of seven leading UK and international artists. It explores affinities with Romanticism in contemporary art practice, and the continuing fascination of the landscape Sublime. Drawn to subjects such as mountains, glaciers, the icecaps, forests, the ocean, the moon and the remotest stars, these artists have found new ways of reflecting on our relationship with the unimaginable forces of nature, even in an age of accelerated technological advance and the unprecedented expansion of knowledge. 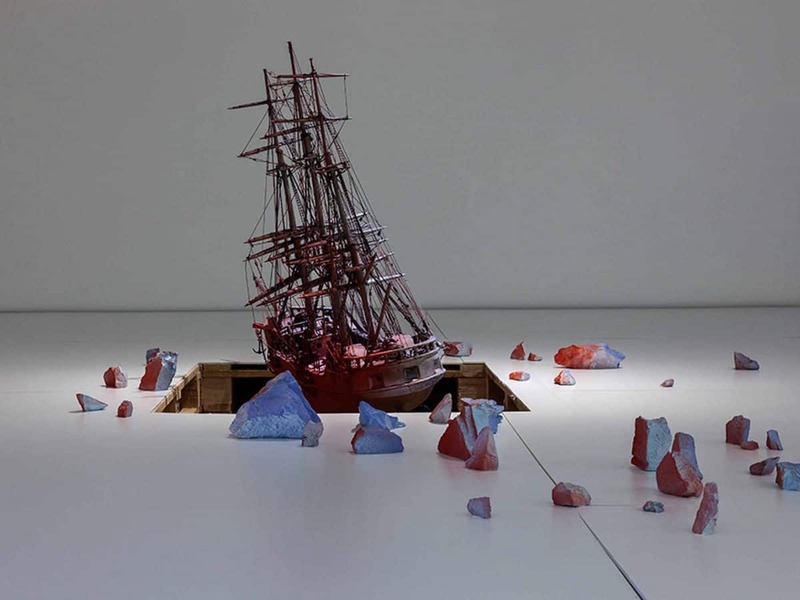 Dominating the largest of the Djanogly Gallery’s spaces, After Life is an ambitiously scaled installation by the UK-based German artist, Mariele Neudecker, made in response to her 2015 Project Pressure expedition to south-west Greenland. It receives its first showing in this country at Nottingham, having been presented previously only once at the Zeppelin Museum in Germany. Sharing the same gallery as After Life, Katie Paterson is represented by her work Timepieces (Solar System). Typical of previous projects in which the artist has drawn upon mind-boggling scientific data, the work consists of nine modified clocks calibrated to tell the time on all the planets in our solar system (as well as the moon) in relation to time on Earth. In a similar vein, Martin John Callanan’s A Planetary Order (Terrestrial Cloud Globe) utilizes the complex apparatus of meteorological data collection to model cloud cover on this planet at a single moment. Both Tim Knowles and Simon Faithfull, each in their different way, are engaged in making journeys in the landscape in the tradition of British Land Art of the 1970s. In his film Going Nowhere, Faithful circumnavigates the ever-diminishing contours of a sandbank rapidly disappearing beneath the sea. Knowles’ journeys are usually undertaken within a system of self-imposed constraints and sometimes under hazardous conditions, or at night. The resulting films, photographs and drawings reveal the play of external forces in the landscape, and capture something of the beauty, risk and absurdity of his ventures. Richard T Walker’s settings are the desert landscapes of the American West, and the mythic quality of the locations contrasts with the artist’s anxious reflections on the meaning of the landscape and its relationship to his own thoughts and feelings. Finally, Rebecca Partridge is not only the originator and co-curator of the exhibition but one of the participating artists. She has just returned to the UK from several years living in the artistic community of Berlin and her paintings of clouds, seas and forests link to the work of Mariele Neudecker in their evocation of the landscapes of that quintessential Romantic, Caspar David Friedrich. Scaling the Sublime is part of the Fringe Programme for The Grand Tour partnership, supported by Arts Council England’s Cultural Destinations fund and the D2N2 Local Enterprise Partnership. Opening Hours: Tuesday to Saturday 11am – 5pm; Sunday (bank hols) 12pm – 4pm. Closed Easter Sunday and Mondays (including Bank Holidays). Nicholas Alfrey, co-curator of the exhibition, chairs a discussion with participating artists. Invited speakers reflect on why landscape is still a compelling subject for contemporary art. The day will include a performative lecture by Simon Faithfull, ‘Elsewhen’ – Looking for Nowhere, in which the artist’s videos, drawings and writings are used to illustrate a meandering path through the politics, science and folklore of ‘Nowhere’. Chaired by Nicholas Alfrey. Nicholas Alfrey considers JMW Turner as a painter of the Romantic Sublime, looking in particular at his images of Alpine passes and crossings. 15 June New Perspectives, a walkabout tour of the exhibition led by post-graduates at the University of Nottingham. Nottingham-based artist, Alison Lloyd, leads a day of exploratory walking using OS maps of Nottingham. This walk, in search of the Landscape Sublime, will involve exploring the terrain and ‘contouring’ some of the edges of the city where man and nature compete using drawing materials and disposable film cameras.